The Department of Mechanical and Industrial Engineering is chaired by Prof. Rodolfo Faglia, Director. He is assisted in his activity by the Department Board. The Department Council, chaired by the Director, is the deliberating organism. It is assisted, to fulfill its work, by a number of permanent or temporary Committees. The Administrative Secretariat (Dr. Chiara Motta) performs all the administrative tasks of the Department. The Department, according to the Italian Law, is the structure that takes care of the coordination of Research (through its Research Groups), which in turn operate within Laboratories. To maintain a high level of quality, the Department is supported by the Research Quality Supervisory Board (Head: Prof. Giovanna Finzi). The Department is also the structure where all teaching activities are located. To this purpose, within the Department operates the Board of the Aggregate Degree Programs in Industrial Engineering (CCSA), chaired by Prof. Giorgio Donzella. The Program Coordinators (Bachelor & Master Programs) participate to the management.The Council is supported by the Teaching Secretariat (Dr. Annalisa Zucca). To ensure a high teaching quality, the Council is supported by the Teaching Quality Supervisory Board (Head: Prof. Riccardo Adamini). 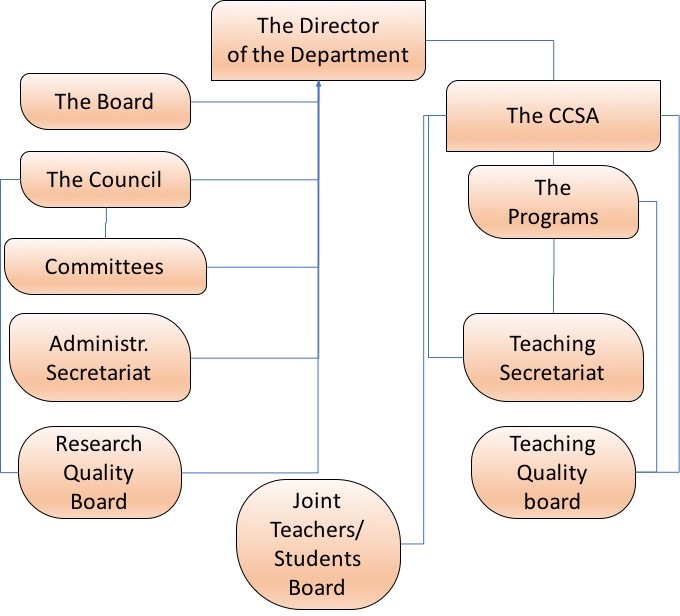 The Joint Teachers-Students Committee (head: Prof. Adriano Maria Lezzi) periodically perfoms the activity of the Programs and reports the evaluation results and its suggestions to the CSSA and to the University Evalutation Board.